Mitty himself, played by Stiller, reflects the movie's intent to advocate for a greater sense of purpose. A doer before he was a dreamer, the former skateboard prodigy was forced to grow up quick after his father's passing, becoming a provider for his supportive mom (Shirley Maclaine) and flighty sister, Odessa (Kathryn Hahn). Sucked into the corporate world—starting with a job at Papa John's and eventually, a 16-year tenure with Life magazine—Mitty finds the meager existence he's carved out for himself under fire when a transition team led by a nameless, bearded executive (Adam Scott) comes to layoff most of the magazine's workforce. This jeopardizes any possibility of a relationship with his co-worker Cheryl (Wiig), especially with the added distraction of a missing photo negative globetrotting photographer Sean O'Connell (Sean Penn) had earmarked for publication on the magazine's final cover as "the quintessence of life." 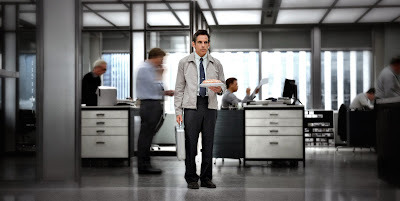 What makes Walter Mitty so attractive a film is the earnestness, the utter lack of cynicism, of its hero. This is no Cable Guy, Stiller's acrid sophomore film. You root for Mitty mostly because, like many of us, he isn't the complete nebbish that I understand (since I admit I don't know firsthand) the character was in the original James Thurber story or in the original Danny Kaye starrer. He is just a guy, who at some point traded in his idealistic outlook for a pragmatic approach to life. Perhaps the single most stirring moment in Walter Mitty is when Mitty daydreams Cheryl singing a karaoke version of Major Tom, a song his cruel boss used to torment him for zoning out earlier in the film. Mitty imagines Bowie's interpretation slowly growing louder to meld with Wiig's as he weighs jumping into a helicopter piloted by a drunk so he can travel to Iceland in pursuit of the elusive O'Connell. For a brief moment, as Mitty soars into the air to catch the copter, the movie takes off. 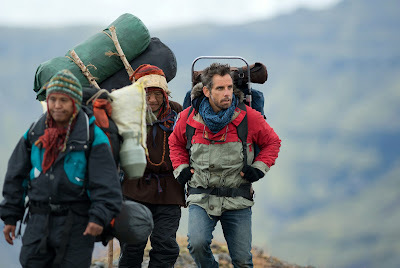 Rightly or wrongly, Walter Mitty ends up being a little too gossamer to have much of a shot at the Oscars, especially with this year's field so thick with trenchant social commentary. But this is the right step in a direction I was surprise the talented Stiller would be interested in heading in. With The Secret Life of Walter Mitty, Stiller stakes out his own path to being taken more seriously as a filmmaker. If he continues as one hopes, it's a path audiences should enjoy following. The Secret Life of Walter Mitty is playing at the 51st New York Film Festival at 6 pm and 9 pm tonight at Lincoln Center's Alice Tully Hall, 1941 Broadway (at 65th Street), New York, NY 10023. For ticket information go online here, or call (212) 721-6500.